- Bibs don't look nice and cover up baby's cute outfit? - Bibs aren't absorbent enough and left your baby's dress wet and lead to dribble rashes and chaffed skin? - Bibs with Velcro irritate your baby's skin, and even damage your favourite pieces of clothing in the laundry? - Bibs with hard plastic aren't comfortable with parents and are difficult to carry? 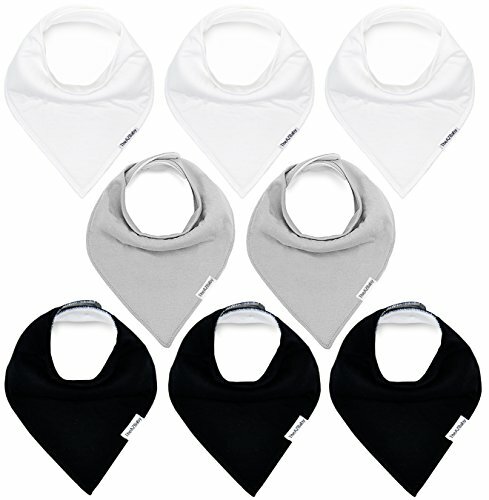 - Pack of 8 Baby Bandana Bibs which Protects baby's clothes from getting wet, Drools, Dribbles, etc. - High quality controls - Manufactured by OME certified manufacturer and gone through several testing to make sure the product stand outstanding and precisely stitched for a superior finish, edges do not get worn off even after long uses. - White, Black, Grey colors look cool and fashionable with any outfits unlike a regular bib. - Perfect solution to the prevention of dribble rash problems. SO ORDER NOW TO GET THE 8 PACK BABY BANDANA BIBS. SUPER SOFT ORGANIC COTTON ABSORBENT HYPOALLERGENIC DROOL BIB - These stylish drool bibs are made of 100% soft organic cotton and 100% super absorbent polyester fleece on the back that keeps your baby completely dry even with the drooliest of babies. great for teething babies! (Intelligent moisture management).TheAZBaby bandana bibs come in a set of 8 pieces & keeps your baby stylish with the trending colors and relief to changing outfits many times a day. NICKEL-FREE ADJUSTABLE SNAPS, DOUBLE LAYER OF FABRIC - The double layered fabric (which restrict any fluid from crossing the bib's boundaries) of bandana bibs fit newborns and toddlers, 2 set of snaps ensure theses bibs will fit your baby with age ranging from 0-24 months. The snaps are secure, making it difficult for infants and toddlers to unfasten but are easy for parents to snap on and off. HEALTHY AND NON ALLERGIC PRINTING AND BEAUTIFUL DESIGN - As a parent we always care about giving best healthy products to our babies because they so sensitive. Our product made with healthy and unique printing and dyeing to make sure it will not harm to the baby's sensitive skin and be the best to protect your baby from drooling. Importantly protect your baby's skin from Dribble rashes. UNIQUE BABY GIFT SET - Every parent love this trendy and stylish baby fashion accessory and these are something used by almost all parents, it's not only care the wetness of the baby but also reduces the work for the new mother; easier to change the bibs than clothes. so make this thoughtful gift as a best gift for baby shower, birth days, holiday gift, christmas or even for a special occasion. Every mama's will love this. Baby looks amazing with the bibs. 100% SATISFACTION AND RISK-FREE - We give Money Back Guarantee to let you buy with confidence; if you are unsatisfied in any way with this product, we will refund your money with no questions asked. However we so confident with the high quality material, design and stitching to give maximum satisfaction to our customers. This durable and long-lasting fabric also ensures that the bibs remain new-like even after several wash cycles. So give it a shot and add it to your cart now! If you have any questions about this product by TheAZBaby, contact us by completing and submitting the form below. If you are looking for a specif part number, please include it with your message.